Museum of the City of New York - Sports, Bathing, Midland Beach. 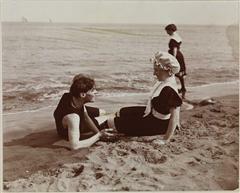 A man and a woman lying on Midland Beach. Another woman stands at the edge of the water.